Warm weather is a great excuse to show off your feet and polished toes, but flimsy flip-flops are one of the common causes of heel pain. Heel pain can seriously impact your day-to-day life, and if your pedicure isn’t done properly, it can lead to serious foot problems like ingrown toenails and foot fungus. Heel pain, ingrown toenails, and foot fungus are not problems you want to deal with in the midst of pool parties, weddings, and vacations. Thankfully, there are ways to prevent these common aliments so you can enjoy a foot-pain-free summer. SUMMERTIME BRINGS WARM WEATHER, AND WHILE YOUR SANDALS AND REGULAR PEDICURES SEEM LIKE A WELCOME TREAT AFTER A LONG WINTER, THEY MAY POSE MORE PROBLEMS THAN YOU REALIZE. Solution: Wear only for short periods of time. It is officially summer and many of us are going to be traveling with our families, so listed below are some helpful tips to keep you and your family's feet healthy during your travels. Wear comfortable shoes through the airport. You never know how long you will wait in line, how far the terminal, or if you have to make a mad dash to make a connecting flight. Wear socks with those comfortable shoes. With security so stringent at the airports today, we’re asked to remove our shoes. Walking on our naked feet across the security platform is less than sanitary. Bring flip flops or sandals. Avoid any barefoot walking in common bathing facilities as this can lead to athlete’s foot or plantar wart type infections. Place a towel on the floor before entering the shower or bathtub. This can prevent slipping once you’re clean. The towel will also help dry and protect those toes from opportunistic infections. If you are traveling more than 2 hours, be sure to stretch your legs and pump your feet. This will help circulate the blood to prevent blood clots. Consider wearing compression socks on the plane to help prevent blood clots by pushing the blood through the legs and back to the lungs and heart. Avoid bringing new shoes on vacation. New shoes tend to be stiff and unforgiving. If you plan to dance the night away, wear shoes that will make your feet feel as happy as you are. Pack a small first aid kit for any blisters or small trauma you might sustain. If you do have trauma, clean your feet with saline (eye solution), apply a small amount of antibiotic cream and cover with a band-aid or gauze. Be mindful of your traveling companions. Assure that your children’s shoes fit well as they will have to keep up with you. Apply sunscreen to your feet. Your feet can be sun burnt and develop skin cancer as other parts of your body. Please follow our tips to ensure a fun and foot healthy vacation! It is summer and as women we like to have nice nails as we wear sandals. However, how do we know we are getting a sanitary pedicure? Here are a few things to look for to check if you’re going to a sanitary nail salon. Was your nail file brand new? Under no circumstances should you ever have the same nail file or buffer used on your feet that was used on a previous salon client. You should always request a new nail file for your pedicure. Sanitary salons may also give you that nail file to take home with you. This is a nice gift that can be used later on and a good sign that your feet were treated with fresh supplies. Is the work area clean of clutter and dirt? If the area on your nail technician’s workstation is cluttered or dirty, you can bet that her tools are not clean. Clutter and dirt make prime areas for fungus, germs, and viruses to grow, putting your feet at risk. How long did the footbath have to sterilize between you and the person before you? Footbaths are breeding grounds for germs, fungus, and bacteria. To sterilize your footbath, your salon should scrub down all sides of the footbath and run a sterilization cycle of at least 10 minutes. What type of liquid are the tools sterilized in? Ask what type of liquid is being used to sterilize the tools treating your feet. Sanitary nail salons use anti-fungal and antibacterial products and/or autoclave their instruments. Please make sure the next salon that performs your pedicure and/or manicure follows the guidelines provided above to keep your feet feeling and looking healthy! Please make sure the next salon that performs your pedicure and/or manicure follows the guidelines provided above to keep your feet feeling and looking healthy for the summer! Have you ever woken up and immediately felt piercing, burning pain at the bottom of your foot? If so, it’s possible you could be suffering from plantar fasciitis. Plantar fasciitis is a form of heel pain caused by inflammation of the plantar fascia, which is the band of tissue that runs along the sole of your foot and connects your heel to your toes. In most cases, plantar fasciitis kicks in first thing in the morning or after waking from a nap, and gradually becomes more painful as time goes by. Do you suspect you might be suffering from plantar fasciitis? 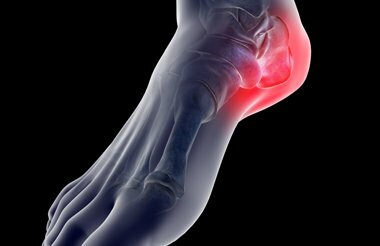 Here are five things you need to know about plantar fasciitis and treatment. 1. How is plantar fasciitis caused? Most cases of Plantar Fasciitis are caused by aging, weight gain or excess weight, wearing the wrong type of shoes, and exercising more frequently or for longer intervals. Also, individuals who have high arches or flat, flexible feet are most commonly affected by plantar fasciitis, and 71 percent of all individuals who wear high heels on a regular basis also tend to suffer from plantar fasciitis. The heel condition can also be triggered by calcium deposits in the heel bone, which can put excess strain on the ligaments that stretch across the bottom of the foot. 2. What type of shoes can help prevent and treat plantar fasciitis? Since plantar fasciitis is often caused by wearing poorly-fitting shoes, most patients report relief after wearing shoes that help stabilize their heels. If your heels hurt when wearing certain shoes, press down on the back of your shoe near the heel to verify that the shoe is firm enough to stabilize your heel. If not, buy heel cup inserts or buy a new pair of shoes that fit more comfortably. Approximately 14 percent of all plantar fasciitis patients report experiencing relief after swapping out their shoes. 3. What is the best treatment for plantar fasciitis? If wearing new shoes doesn’t alleviate your heel pain, make an appointment at one of Our Offices as soon as possible. We can fully assess your heel pain to verify whether you’re experiencing plantar fasciitis or another foot problem, and prescribe the necessary course of treatment. Possible treatment options include custom orthotics, nonsteroidal medications and/or cortisone injections. In severe cases, surgery may be recommended. 4. What types of stretches can help relieve heel pain? Cross your left leg over your right knee, and grab your toes with your left hand. Press your left foot toward your left knee, and hold for approximately three seconds. Release the stretch, and pull your left foot away from your knee. Repeat this stretch five times on each leg. 5. When should I see a podiatrist? If you start experiencing sudden severe heel pain out of the blue, make an appointment with one of Our Offices as soon as possible. This is especially important for athletes, since complete rupture of the plantar fascia can lead to major setbacks and recovery that could take several weeks. In some cases, patients may be required to wear a boot and use crutches until the plantar fascia is completed healed.